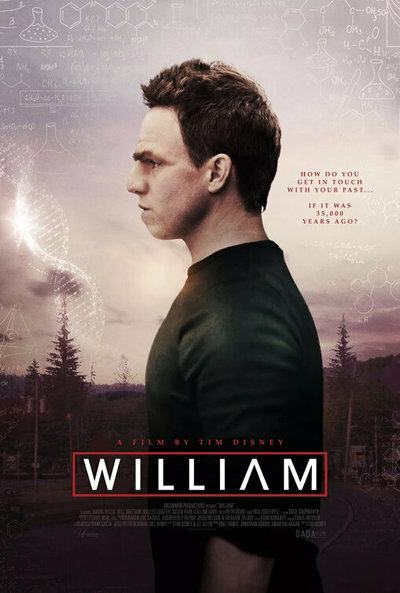 Tim Disney’s “William” ponders what might happen if a Neanderthal clone were to be born to parents of vastly different scientific ideologies. What if the medical doctor mother (Maria Dizzia) wanted the half-human boy to do whatever he wanted after high school, but the professor father (Waleed Zuaiter) wanted him to always be devoted to science? Yet in spite of this curious premise, “William” simply devolves into a drab, moody morality tale for parents about not treating your kids like test subjects. Created from the non-fossilized remains of a Neanderthal conveniently found near his parents’ college campus, William is the muscular, fairly hairy, and introverted mix of human and Neanderthal. With the main William shown to be high school age (played by Will Brittain), Disney jumps back and forth to different stages in his life, and shows how he’s a curious but very literal being, the latter especially when talking about Shakespeare with a tutor, or not getting word-pun jokes from his friends. He's incredibly strong too, as when he crinkles a bully's hand after one of them tries to start a fight because William looks different. William is played by actors of different ages, often with the young actors having prosthetic noses and emphasized, extra hairy eyebrows, making them looking permanently furrowed. That last detail is fitting for Brittain’s main performance, who tracks William through coming-of-age experiences (the euphoria of leading a high school play, the downfall of romantic rejection), and does so with a constant curiosity, always tilting his head from one side to the next. But as the main focus of the story, Brittain is defeated by an unenviable task—expressing how someone might think if they were a clone and Neanderthal, and trying to make an emotionally opaque character interesting. Throughout his life, William sees that he’s different from others, something the story has a clunky way of expressing. Even a squad of vaping hoodlums are used to make him feel uncomfortable, their smoke plume menacingly filling the screen after they make some dismissive comment to him. But the most bizarre moment might be when William is seen scanning the Wikipedia for Neanderthal, and mournfully looks like at an image of the 1992 Pauly Shore-Brendan Fraser classic “Encino Man,” as if the movie were an example of cave man-face. The script's seed of compassion for those who are different is intriguing, but the story has such a warped way to talking about how a special kid should be treated. It becomes a tone-deaf idea for any kid who feels like an outsider in their own way, and for parents who aren’t sure what to do about it. Meanwhile in the background of William’s coming-of-age story, his parents Barbara and Julian are separating. Once an "academic power couple," their ideologies diverged on how he should be supported, and what his ultimate purpose is. They separate, find new significant others, and pull William in two different directions. The story flattens when it should be making us care about their destructive disagreement, but the dilemma becomes so blunt that the misguided father takes the form of a plain villain. It’s curious that the movie has a more intimate lens for what would undoubtedly be a scientific revolution, but there is little nuance to the headier conversation about parenting and science that “William” dreams of having.